Sheet vinyl and linoleum are resilient flooring options manufactured in roll widths of six to 16 feet. Linoleum can also be made in tiles. Both require low maintenance, are moisture resistant, and can be treated for infection control. As a result, they are ideal options in hospitals and schools where there is a need for less seams. 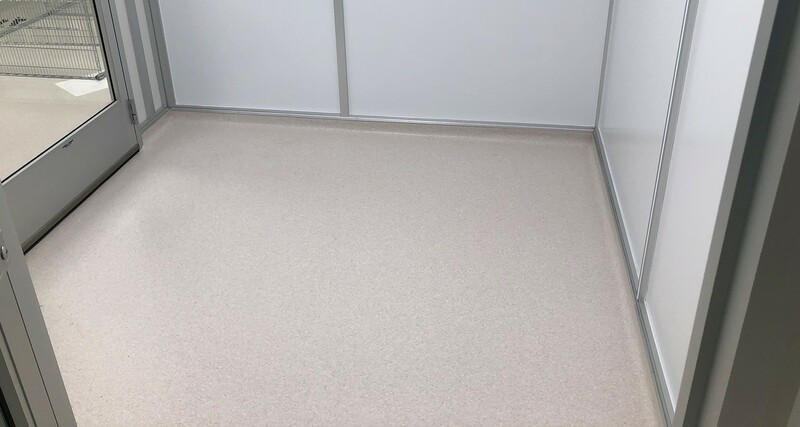 We have significant experience working with sheet vinyl and linoleum in healthcare environments where installation needs to be exacting. Carpet Tile & Broadloom Carpet chevron-icon Created with Sketch. Porcelain & Stone Tile chevron-icon Created with Sketch. Hardwood chevron-icon Created with Sketch. LVT & VCT chevron-icon Created with Sketch. Sheet Vinyl & Linoleum chevron-icon Created with Sketch. Specialty Flooring chevron-icon Created with Sketch.